Nick Jonas and Priyanka Chopra tied the nuptial knoton December 1 as per Christian traditions followed by a Hindu marriage, the next day. Their pre-wedding festivities included sangeet and mehendi ceremonies wherein the ladkewale and ladkiwale had a blast. In fact, the happy bunch of pics from those ceremonies have now become the talk of the town. 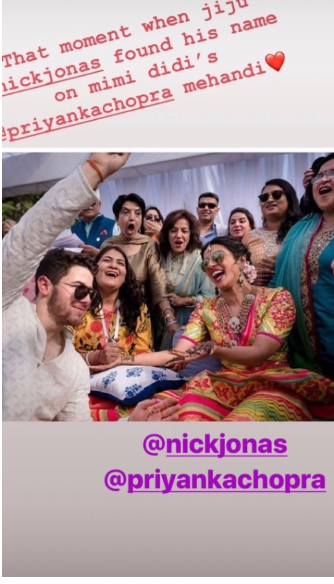 Priyanka’s cousin, Parineeti Chopra, who was her bridesmaid, shared a picture from #NickYanka’s mehendi ceremony revealing Nick’s reaction on seeing his name written in PeeCee’s mehendi. That moment when jiju Nick Jonas found his name on mimi didi Priyanka Chopra’s Mehandi,” she captioned the picture. Priyanka and Nick tied the knot at Umaid Bhawan Palace in Jodhpur. Post which, they held a reception in Delhi for the actress’ extended relatives. PM Narendra Modi marked his presence and blessed the newlyweds. As for their Mumbai reception, it is set to take place by mid-December as per a Pinkvilla report. Rumours are rife that #NickYanka will host a reception in The United States as well.